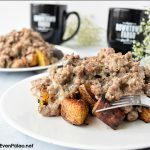 Homemade paleo sausage gravy smothering a pile of breakfast potatoes. Heck. Yes. Did I mention you can enjoy this on a Whole30? In a medium-sized bowl, mix all ingredients with your hands. Be careful not to over-mix or the sausage will get dry and tough. Store in the fridge until ready to make the sausage gravy. Bring a pot of water to boiling. Add the cubed potatoes and boil for 2-3 minutes. Remove from heat and strain. Heat 1 Tbsp of oil in a large skillet over medium-high heat. Add par-boiled potatoes. Let cook for 5 minutes (don’t touch them early!) then stir. Add half of spices and add more oil if necessary, but be careful; adding too much oil will result in soggy, uncrisp potatoes. Cook for 5 more minutes. Divide breakfast potatoes between two plates. In a large cast iron skillet, brown sausage over medium heat. Once cooked through, remove sausage with a slotted spoon and set aside, leaving behind the fat. In the same skillet, add the arrowroot flour and immediately whisk with the fat. Continually whisk for about a minute until the mixture turns thick, making a roux. Add coconut milk about 1/4 cup at a time, whisking with the roux until entirely incorporated. Once all the coconut milk has been added and the mixture has thickened, add the spices and adjust seasonings to your taste. Finally, add the sausage and stir until it is heated through. Divide between the two plates of breakfast potatoes and feast immediately.